Apple has released iOS 10.2 beta 5, just a few days after releasing beta 4 of 10.2. It’s unclear why there was such a rapid release of iOS 10.2 beta 5 so close to the release of the fourth beta, but some speculation suggests the new build could be aimed at addressing the ubiquitous iCloud invite spam problem, or patching some other critical bug for beta users. It’s also possible the release is simply getting closer to the final version and thus Apple wants to test the latest beta build. 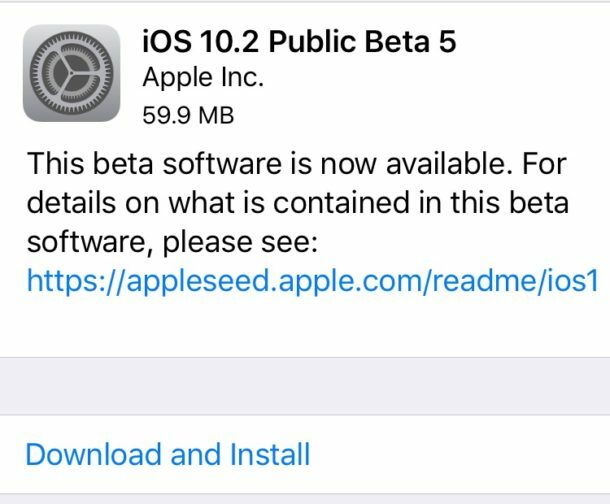 Those who are enrolled in the iOS beta testing program can find the iOS 10.2 beta 5 update available now through the OTA software update mechanism in the Settings app of their iPhone, iPad, or iPod touch. The update is available for developers and public beta users. Generally, iOS 10.2 will include new emoji icons, and several minor revisions and feature improvements to the mobile operating system for iPhone and iPad users. It’s unclear when iOS 10.2 will be released as a final version to the general public, but Apple typically goes through a variety of beta releases before unveiling the final stable build to everyone. My iPhone 6 randomly shutdown after this update. How fix this?